Thalapathy Vijay’s Mersal was finally released for this Diwali after struggles. The movie opened up with positive reviews and a thunderous start. Here are the detailed box office collection report worldwide. 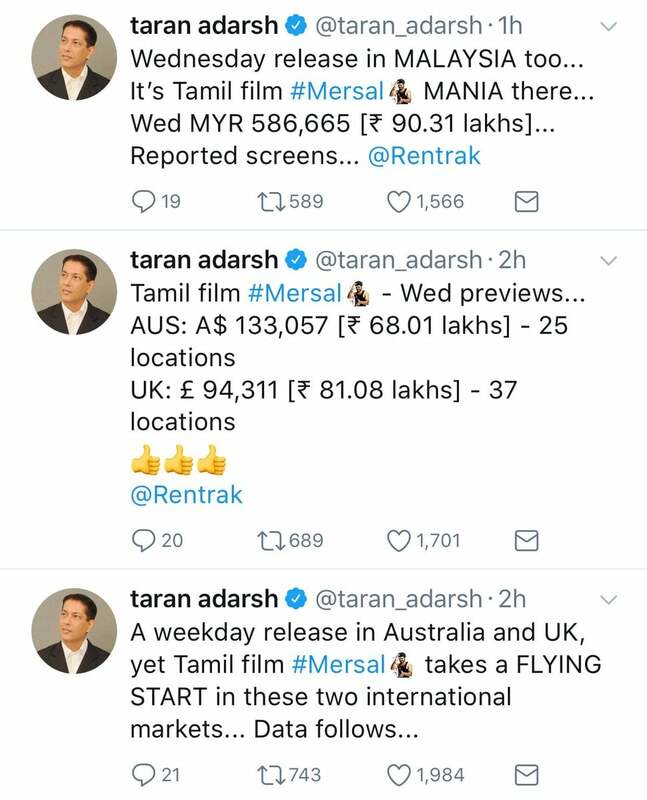 Mersal has taken the box office by storm. The Chennai Box office gross is approx 1.52 Crores even without the release in PVR and INOX. This is the all-time Day 1 Gross surpassing Vivegam ( 1.21 Crores ) and Kabali (1.12 Crores ). The film has released in around 3250+ Theatres worldwide which is huge next only to kabali. Mersal Day 1 Kerala gross – 6.11 crores 2nd highest in the state after Baahubali 2.